Whether you use iPad, iPhone, Android, Android tablet, Windows Phone 7 or Windows tablet*, all you have to do, is go to the App Store, Play Market or Marketplace and search for “Resco Mobile CRM”. The app is free, has no functional or time limitation. Although the app comes with demo data and lots of features, such as dashboards, charts, maps, photo and signature capture, it is always better to show your real data. 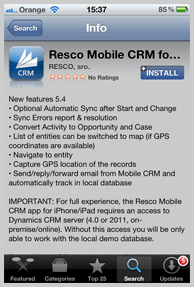 As Resco Mobile CRM does not require any server, middleware or server components, connecting the app with your CRM server is very easy. 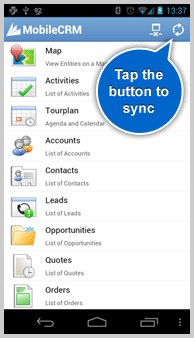 Tap the sync button (little arrow) and fill in the info about your CRM server. If you really want to impress your audience, consider making a tailor-made demo. 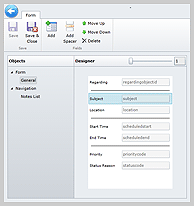 Download Woodford—easy to use configuration tool—to modify the app. You can add custom or new entities, redesign dashboards, create new charts, define sync filters, create multiple views and much more. I guarantee your prospects will love it. With mobile customer-relationship-management apps, A businessman can harness his/her critical client data regardless of location. One can use mobile CRM apps at trade shows, sales appointments and vacations to track sales, keep notes, schedule meetings and more.